Who wouldn't appreciate a gift when it is presented in a beautiful paper maché gift box, even a batch of homemade cupcakes or muffins in a paper maché box that looks good enough to eat! 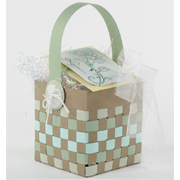 We have previously used coloured card to make gift boxes and here's another gift box ideas for small gifts and treats. 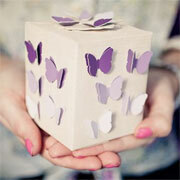 Make your own inexpensive Valentine gift boxes using coloured card and give to your loved one this Valentine's Day. 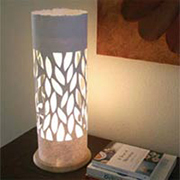 Here's how to make a nightlight or decorative lamp using straws or paper tubes, cardboard and an LED lighting strip. 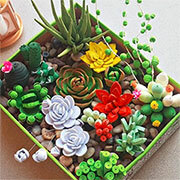 Hard to believe that this everlasting display of succulents is crafted entirely of paper - using the quilling method. 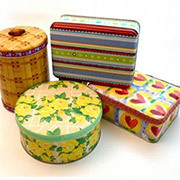 Many stores sell Christmas goods in tins, and here's a way to turn these into practical and pretty storage containers. 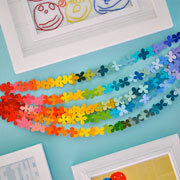 Use coloured paper to make a bunch of everlasting Spring flowers to brighten up your home. 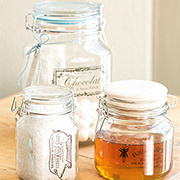 These easy to make vintage storage jars will add the perfect finishing touch to your pantry or countertop. After recently hunting high and low for decent silk flowers and discovering the ridiculous cost for a single stem, my sights have turned towards making crepe paper flowers. 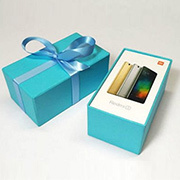 Quality gift boxes can sometimes end up costing more than the gift. 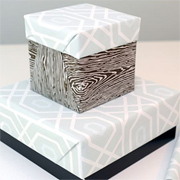 We show you how to make your own rigid gift boxes for any size or shape of gift. Use paper doilies, coloured paper, glue and string to embellish a table and add a wonderfully feminine touch to your Mother's Day decor. 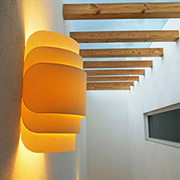 These paper walls lights are the most affordable and easy to make lights you can add to your home. The design is elegant and modern and it's hard to believe they are made of plain paper. I have been following Lia Griffith for quite some time. Using different types of card and paper she crafts some amazing designs for home decor and holidays. If you are looking for an affordable, quick and easy way to dress up a table for a special occasion, these paper lanterns are just the thing. All you need is some cardstock, a template and a craft knife and cutting mat to make your own decorative paper lanterns. It's also a great way to repurpose mis-matched or chipped glasses! 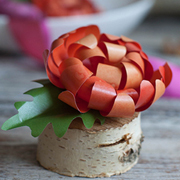 If you need to organise a unique centrepiece, make your own home decor, decorate for a party or special occasion, or are looking for DIY ideas for a wedding, these are the most gorgeous paper roses you will find on the Internet. 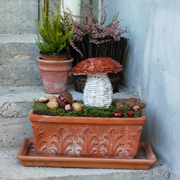 Using paper mache to make your home decor is an easy, fun and affordable way to add a few decorative accents to a home. These paper mache pots are super easy to make, and you can even add lids and use them for storage. 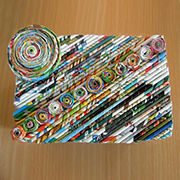 We put together some easy-peasy crafts that the kids can do using old magazines. 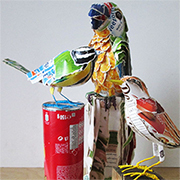 I have had fun using magazines and newspapers rolled into tubes and realised that this is a great project for young kids, and a great way to recycle old magazines. 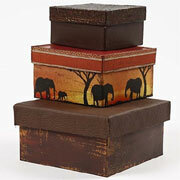 These pretty trinket or keepsake boxes are made using recycled cardboard, some glue and paint. 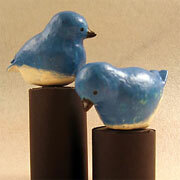 You can make them as gifts or for storing treasured or special items. Chinese paper lanterns with style! 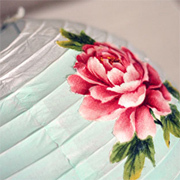 If you have a China Mall close to you, or a discount home store, you will find inexpensive Chinese paper lanterns . 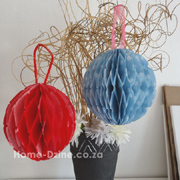 These paper lanterns are perfect for dressing up for a special event or party, and you can even hang them in your home. 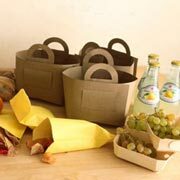 I have spent hours looking for projects on rolled newspaper or paper baskets and have discovered so many easy ways to use rolled newspaper to make baskets in various shapes and sizes - and it's so easy! 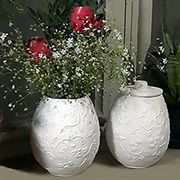 If you feel that weaving with rolled newspaper to make baskets might be too much for you, consider using rolled newspaper tubes in an easier method to create home decor accessories. 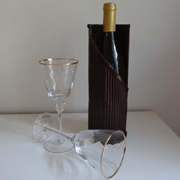 In this project you roll newspaper tubes to create an attractive wine bottle holder - and it won't cost anything other than a few supplies that you probably already have. It's official... I am now hooked on weaving with newspaper. Having just completed my first two paper weaving projects using newspapers I can't wait to get stuck into the next project. 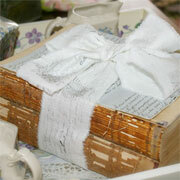 I have just discovered how easy it is to weave a basket using newspaper! It's so simple to roll paper tubes out of newspaper and then weave the tubes into a basket. 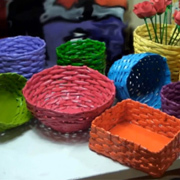 Discover the art of weaving paper baskets, from a basic weave basket for the beginner, to a faux wicker basket made from rolled paper that you can use for storage. Pattern paper is lovely and soft and is lovely for using to make a weave basket. 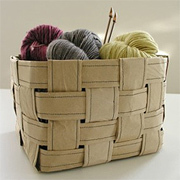 You can also use soft brown or white paper to make a pretty decorative weave basket. 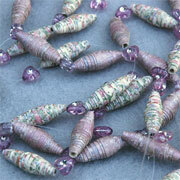 You can also substitute with colourful or patterned tissue paper. If you have rolls of wrapping paper leftover from the holiday season, you can either store it until next year, or use it in other ways. 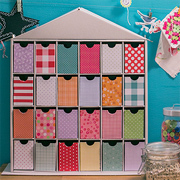 Using leftover wrapping paper or decorative scrapbooking paper is one of the fun ways to make your own decorative storage boxes. 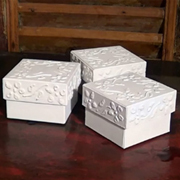 Recycle gift boxes, shoe boxes or cardboard boxes into attractive storage boxes for your home. When setting up a home or small business, having business cards printed is the first thing you do, or should do. 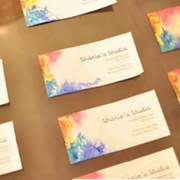 This project shows how you can transform plain printed business cards (on the cheap) into colourful creations. 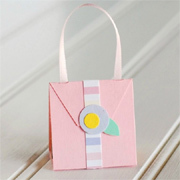 So simple to make and pretty to look at, these cardboard gift boxes are designed to look like a small purse. 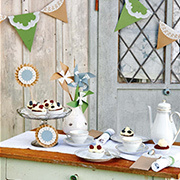 Perfect for party favours for a little miss birthday party, or for a special event. 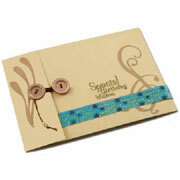 You can customise the design using plain or patterned cardstock in any colour. I have seen these honeycomb garlands popping up all over the Internet. When I was young my whole family used to get together to make all the Christmas decorations for our home, from honeycomb balls to crepe paper garlands and making them is actually quite simple. 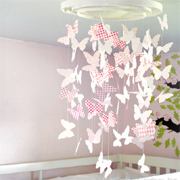 Make this paper butterfly mobile or chandelier for a nursery or a little girl's bedroom. 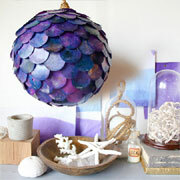 You can use colourful wrapping paper or patterned scrapbook paper to make the chandelier to match existing decor. Buying gift boxes has become very, very expensive. Even a simple gift box can cost from R30 upwards. 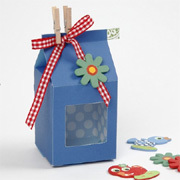 To make your own gift boxes you only need colourful or patterned card and a few other items. 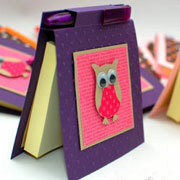 And you can even make your own colourful card by using your PC printer. Decorate cardboard boxes with fabric, wrapping paper or faux leather to create an attractive display that's also useful for storage. I like to collect shoe boxes and packing boxes and then re-use them, and covering them up means you can put them on display. Using nothing more than flour, water and newspaper I would sit and craft for hours on end making bowls that would be painted in bright colours. 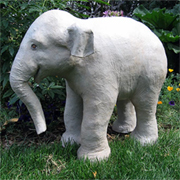 Crafting with paper mache is a hobby that is very inexpensive and uses materials readily found in the home. Hosting a party or celebration can cost a fortune. 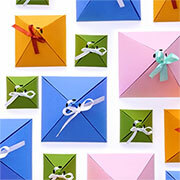 Simply by making your own party favour boxes you will save a substantial amount. 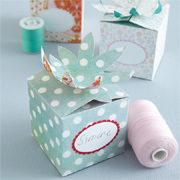 Plus, these party favour boxes are also ideal as gift boxes. 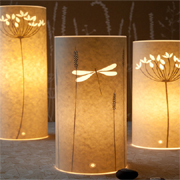 Take a look at these beautiful table lamp designs by Hannah Nunn. 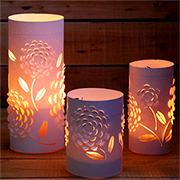 The lamps are made of parchment or wax paper and although Hannah uses a laser to cut out the designs on each lamp, you can use a craft cutter. 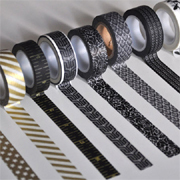 Washi tape is a printed Japanese paper tape that is self-adhesive and comes in rolls like regular sticky tape. What makes washi tape so special is the designs and colours it comes in. 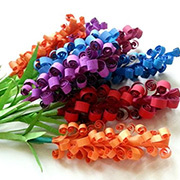 Make beautiful paper mums as decor accessories, or use them as serviette rings, or make up a colourful selection and give them as a gift. If you are planning a party, event or special occasion, these fabulous ice cream cone flowers are just the thing for adding a splash of colour. 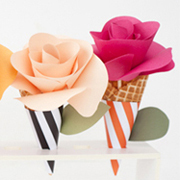 The flowers are made of colourful paper and a sugar cone is wrapped with striped paper. 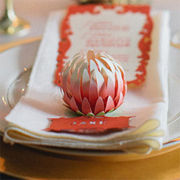 These beautiful place card proteas look complicated but are actually quite simple to make. 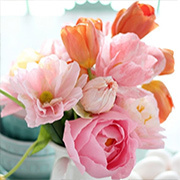 Make your flowers using card stock or paper in pretty colours and then use them as place card holders or as elegant decorations for a special table setting. 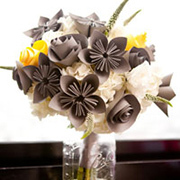 Don't you just love these gorgeous paper flowers. They look so delicate and life like. I found the Spanish instructions on dri and just had to share with you. 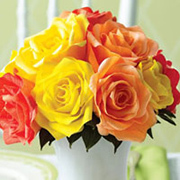 These paper flowers are perfect for a special occasion, wedding or event, or even to add a splash of colour to a home. 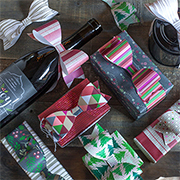 Instead of wrapping your presents with boring sellotape, make rolls of pretty decorative wrapping tape with your favourite patterned wrapping or scrapbooking paper and double-side tape. 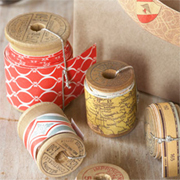 This wrapping tape is also perfect for wrapping up plain, brown paper wrappings. Not only ideal for weddings and parties, these free templates for gift boxes and party favour boxes are perfect for Christmas, celebrations and special events. Download the free templates, print out and then make your own gift boxes or party favour boxes. Christmas is not too far away (again) and that means time to start hunting around for suitable gifts for family and friends. I am one of those that likes to give and receive gifts made with love, and this is one of those gifts. I'm not much of a jewellery person, but when I do wear jewellery I like to go over the top and really wear lots of it. The idea of being able to make my own really big, bold and colourful jewellery is exciting and I can't wait to get started on my first pair of paper bead earrings! I love the emergence of crafts with butterflies, particularly those that are easy to duplicate without much fuss and at little cost. Paper butterflies are so easy to make and you can print them out on your PC printer or use wrapping paper to create beautiful colours and designs. This lamp shade is translucent when the light is switched on and is made by dipping paper circles into wax that has been coloured with dye or food colouring. I come across so many great websites as I browse the Internet and see so many wonderful ideas. Here are some creative ideas that cost hardly anything for a result that is unique and fun. 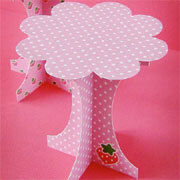 Crafting with coloured paper is an affordable way to create your own fun decor. I am so in love with this little cutey. The project is made using coloured card. 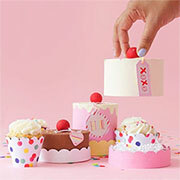 Instead of forking out to buy a cupcake stand, you can print our your designs to match a themed party. Colourful card stock can be used to make a colourful wall clock that won't cost much and you can colour coordinate to match your decor - and change it anytime you want! Party planner, Jordan, made up some picnic baskets using butcher paper - you could also use medium-weight card or poster board. 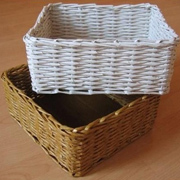 These cute baskets are actually quite sturdy and would be great for a children's birthday party or similar event. We've previously featured a project that show how to use buttons in so many ways, and one way was to use them to decorate gift and greeting cards. 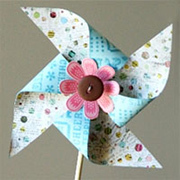 Here are a couple of craft projects where you can use buttons to embellish gift and greeting cards. Quilling has been around for years — hundreds, in fact. 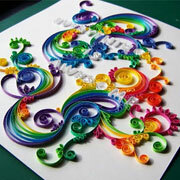 Nowadays, quilling is used to create artwork, greeting cards and other decorative items. 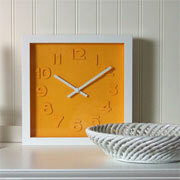 Match your wall art to the colours in your room with funky paint swatch wall art. 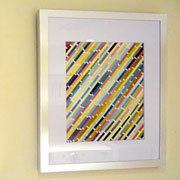 If you already have a couple of frames, this project won't cost you a cent. 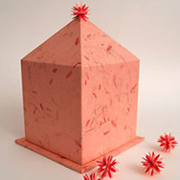 I recently stumbled across a post that has some really nice projects and shows you how to make a very good paper mache recipe. 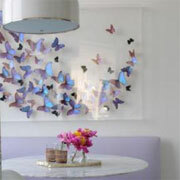 Create a dramatic artwork for your home at a cost of less than R200 for all your materials. 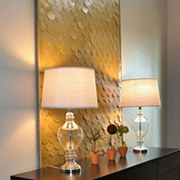 You can make this as small or as large as you wish for instant impact and just a touch of metallic glitz. Use it for lotions, ointments, herbal teas, or chocolate before giving it as a gift. Once the treats are gone, your gift box becomes a beautiful pink pill box, that can be used for storage. 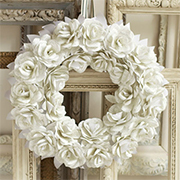 Planning a wedding or looking for a new way to display flowers in your home? The kusudama is an ancient Japanese craft that uses paper to create multiple identical origami shapes that are glued together. Light and paper are always a good combination, and indirect lighting can be such a nice way to soften the feeling in a room. Add a little bit of a three-dimensional design and the impact of this simple project will be self-evident. 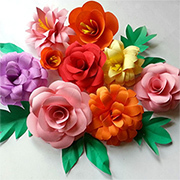 Another craft that has been re-invented is using crepe paper. 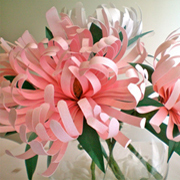 I have seen these gorgeous crepe paper blooms all over the Internet - it's hard to believe that they are so easy to make. 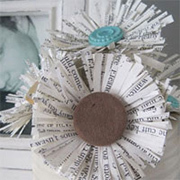 You can make these adorable flowers with newspaper and buttons. 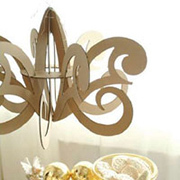 Here's a way to use cardboard boxes to make chandeliers for your home - affordable too!